The essential Chart Symbols are now easy to locate as they have been grouped so that the most important ones can be found in a hurry. Dangers: Rocks & Wrecks. 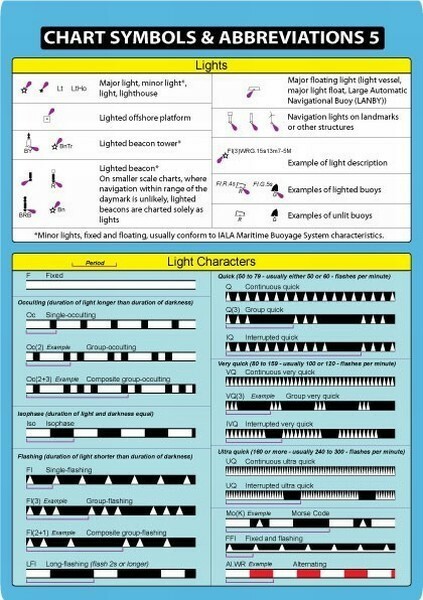 Buoyage, Beacons, Cables & Pipelines, Bridges, Obstructions, Depths, Limits, Contours, Soundings, Tide Levels, Lights, Leading Lights, Sector Lights, Nature of Seabed, etc. 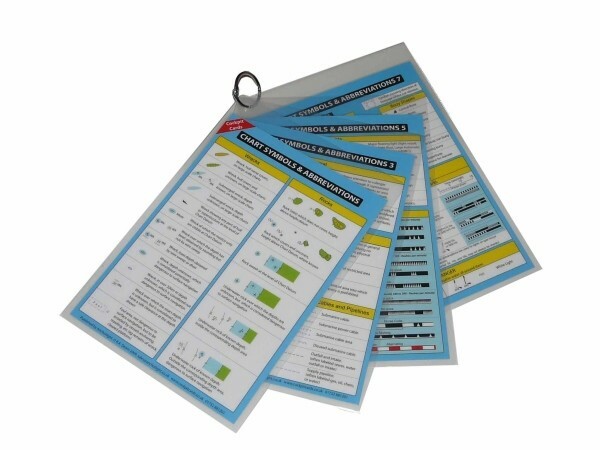 This set will be invaluable to all who use Charts and the waterproof encapsulation means it can safely be used on RIBS and other wet craft. Consisting of 4 double sided A5 cards of crisp and clear images, printed using light-fast ink and encapsulated with a heavy duty plastic for cockpit use and abuse. Grouped together in one corner so that any sheet may be removed for individual use if required. Great for Cockpit use.